Both deafness and blindness are thieves that steal independence. When they reside in the same individual, their thievery combines synergistically. Most deaf-blind persons must rely heavily on assistance from others to conduct many of their daily activities. Whether these helpers are professionals or family members, their time is also stolen. Although it may give them a feeling of fulfillment, the time they spend in helping a dependent individual is time taken away from doing other things. Some family members must actually stay close to home just to be able to regularly oversee the medication needs of their deaf-blind relative. In order to learn more about the technology needs of deaf-blind consumers, the senior author developed a questionnaire. Rehabilitation counselors/interpreters generously volunteered their time and skill to administer the questionnaire to their deaf-blind clients. Although this study was conducted informally, agencies in seven different states participated, resulting in 61 completed questionnaires. Two questions were specifically designed to yield information about the taking of medication. The first was merely an attempt to learn how many deaf-blind individuals take medication. 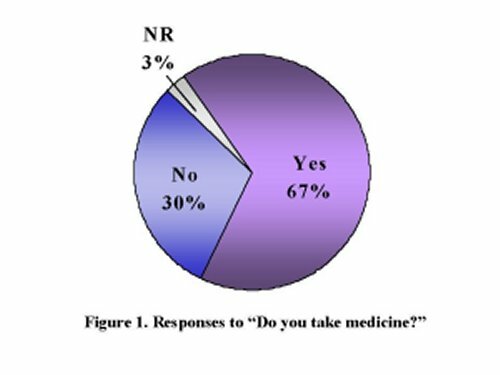 Sixty-seven percent of those questioned indicated that they take medication (Figure 1). The medicine-takers were then asked "How do you know when to take your medication?" As indicated in Figure 2, 30% indicated that someone reminds them, 24% use a clock, talking clock, or large print watch, 14% associate taking the medication with activities; and 5% "just remember." Two percent did not answer this question. There are some devices on the commercial market which can remind people when to do something, and some even target the medication-taking issue. These devices, however, are not usable by deaf-blind persons for two reasons: (1) they require vision to set the alarm times, and (2) they require hearing to detect the alarms. To address these two primary issues, we designed a reminder with two unique features: a means of tactilely setting multiple alarms, and an alarm signal which is vibrotactile. In addition, to assure that the device would be easy to carry, stay in contact with the skin, and enable the user to know the current time and compare it to the alarm (medication reminder) times, we chose the device to be a variation of a "braille" wristwatch. These analog watches require only touch both to set and read the time, as well as set and read the alarm times. The unit also includes a digital clock to work with the microprocessor. 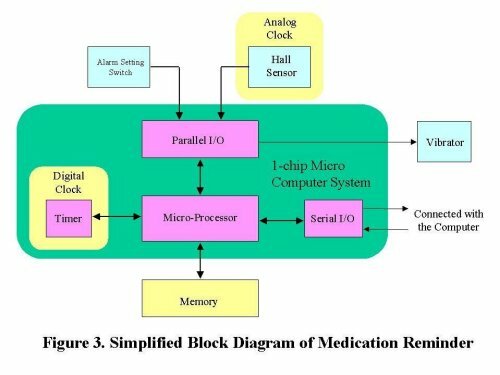 Figure 3 shows a block diagram of the medication reminder. Note the motor-driven analog clock and the microprocessor-controlled digital clock. The times of the two clocks are synchronized. Figure 4 shows the various components of the watch. Deaf-blind people are generally familiar with analog clocks with raised dot markings. The alarm system, however, is best designed with a digital clock which is controlled by a microprocessor. It is easy to design a small computer system using a microprocessor which to control many functions. And every computer includes digital clock essentially. This clock allows for setting multiple alarm times. In this system, a deaf-blind user can adjust the clock time by turning the watch stem and feeling their locations as they do with any ordinary braille watch. The digital clock is designed using an 8 bit single-chip microprocessor which includes two 8 bit parallel interfaces, two asynchronous serial interfaces, and 3 channel timer interfaces. This microprocessor also controls the alarm settings, the synchronization between the analog and digital clocks, an RS232C interface, and alarm vibration. To synchronize the analog and a digital clocks, the position of the hands are detected by using 2 small magnets on hands and two rings of 12 Hall sensors are set around the dial. The outer ring of Hall sensors is positioned to line up with the magnet on the minutes hand, and the inner ring of Hall sensors is positioned to line up with the magnet on the hour hand. The microprocessor adjusts the digital clock in accordance with which Hall sensors detect the magnets on the clock hands. In this synchronized mechanism, the maximum error of synchronization is 5 minutes. To set the alarm times, the deaf-blind user pushes any of 12 button switches which are positioned around the dial. When not being used, these switches are protected by a cover in the shape of an annulus. The microprocessor detects the opened cover, and switches the device to the alarm setting mode. Alarm times can be set as frequently as every 5 minutes. The medication reminder is able to memorize up to 32 medication times per 24 hours, and differentiate AM from PM. The actual alarm signals are vibration. 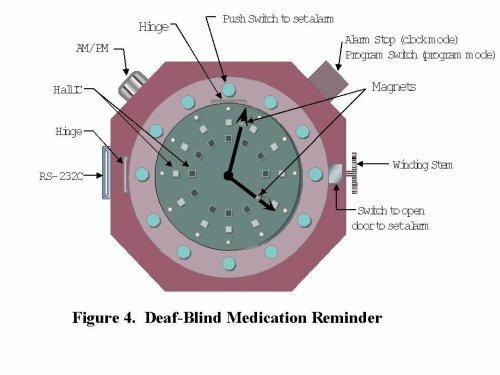 It is anticipated that the needs of some deaf-blind consumers would best be served by having a pharmacist or other healthcare professional set the clock and program the alarm times. We have therefor also incorporated a serial interface (RS-232C) for connecting the device to a computer for remote programming. This new medication reminder was developed specifically to meet the needs of deaf-blind patients. Its design will foster medical independence. The transfer of responsibility from the caregiver to the deaf-blind consumer is of great benefit to both parties.